Ivan Gonzalez, M.D., with Yessica Flores and her daughter, Daniella Yac. While some babies with congenital Zika syndrome are born with serious abnormalities, such as microcephaly (small heads), about 80 percent of children and adults infected with the Zika virus have no symptoms at all. Researchers have determined that the Zika virus can be transmitted by mosquitoes in tropical environments and by unprotected sexual relations with a partner exposed to the virus. Supported by a $1 million grant from the U.S. Centers for Medicare & Medicaid Services, the multidisciplinary UM center was established in 2017 to provide care for Zika-exposed and infected infants, follow their development, and provide specialized care later if needed. 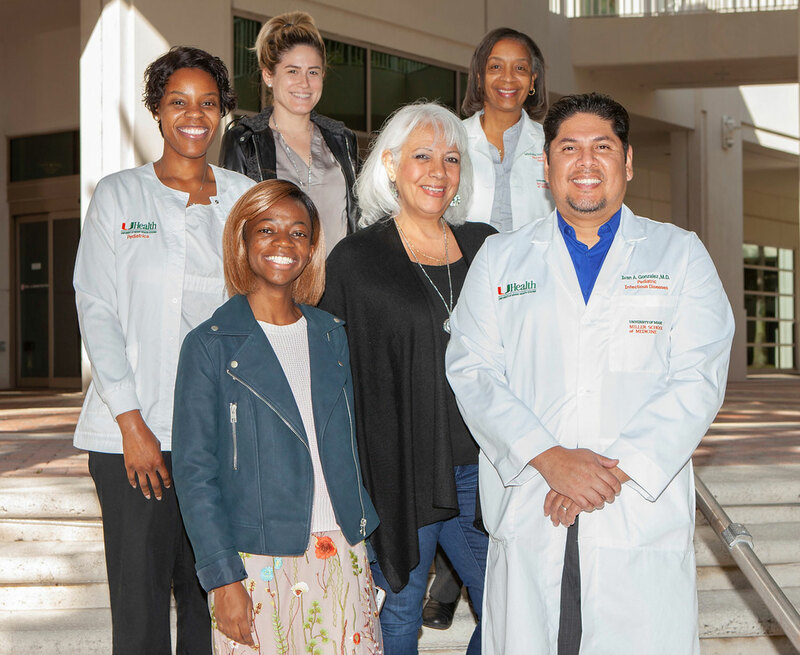 Comprehensive Zika Response Team: top row, from left, Wilmide Dominique, RN (clinical nurse), Katryna Cruz (case worker), and Michelle Hylton, RN (nurse manager); bottom row, from left, Marie Fatil, MPH (clinical research coordinator), Ana Garcia, Ph.D. (mental health clinician), and Ivan Gonzalez, M.D. It was the first such program in the continental U.S., and it served as a model for similar centers in Tampa and Houston. Other federally funded Zika clinical programs focus on young patients in Puerto Rico, the U.S. Virgin Islands, and American territories in the Pacific that have experienced Zika outbreaks. Now, the pediatric team is tracking 75 children, from 1 week to 2 years old, through the UM Zika Resource and Referral Center. Most of these cases are due to the mother being exposed to Zika while traveling, rather than contracting the virus here in South Florida, said Dr. Gonzalez, adding that more than 75 percent of the infants are in families with incomes below the federal poverty line. To date, Dr. Gonzalez has identified language delays in several Zika-exposed infants, but no problems with learning to walk or other motor skills.